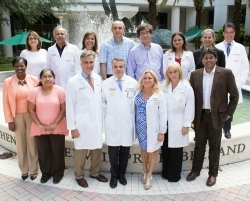 ​In collaboration with Dr. Mehdi Mirsaeidi of the Miami VA Medical Center and Division of Pulmonary, Critical Care at University of Miami Miller School of Medicine, our grant to develop Sarcoidosis Granuloma within a Lung on a Chip has received funding from Mallinckrodt Pharmaceuticals. PM Lab is proud to announce that we received 2 grants from the Coulter Foundation for Translational Research in 2016! Based on our recent patent applications, Grant#1 is to help commercialize Continuous Perfusion Organ on Chip Platforms for Drug Discovery. In collaboration with the Miami Project to Cure Paralysis, Grant #2 is to develop an in vitro model of Neurotrauma. PM Lab traveled to PITTCON 2015 in New Orleans; great exposure to microfluidic instrumentation and solutions. Ashu delivered an invited talk highlighting the role of practical microfluidics for Diabetes Research. 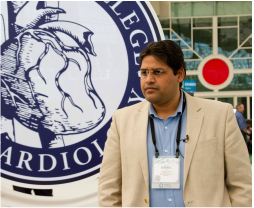 Ashu also presented our Heart Microsystem at "Futures of Cardiovascular Medicine" symposium at the American College of Cardiology annual conference in San Diego. 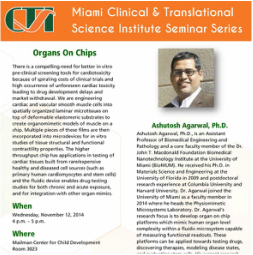 Ashu presents a research update at the seminar series of University of Miami Clinical and Translational Science Institute. In addition, he is invited to speak at the Foundations of Translational Science Boot Camp 2014. 11/14 Physiomimetic Microsystems receive NIH Funding! 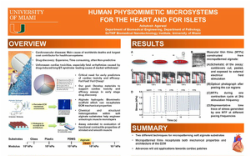 Our collaborative proposal "Human Physiomimetic Islet Microsystem" was recently awarded funding by NIDDK. Our team will develop an organ-on-a-chip platform for pancreatic beta cells which could serve as a platform for screening drugs, studying disease progression, optimizing primary beta cell culture, and directing stem cell differentiation of beta cells. 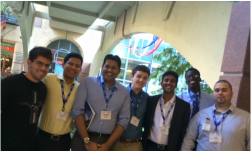 As a part of University of Miami team, Ashu travels to San Antonio TX to attend the Annual BioMedical Engineering Society Meeting. 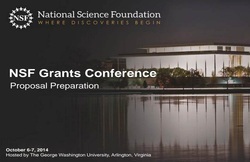 As a part of professional development, Ashu travels to DC to meet with NSF program officers and attend a Grant writing workshop. Here's hoping for a NSF Grant!! First invited talk at a conference! 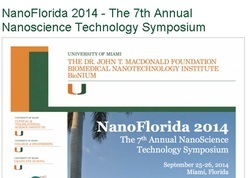 Ashu presents the design of NEMS based Heart on a Chip at NanoFlorida 2014. This student-friendly conference brings together researchers in the State of Florida for scientific exchange and to help identify emerging challenges at the frontiers of nanoscience and technology. This year, the conference was held at the University of Miami campus and we could also showcase the soon to be completed clean room facilities. Ashu gets invited to the "Frontiers in Bioengineering" Workshop at the Department of Bioengineering at the University of Illinois at Urbana-Champaign. The annual workshop is supported by the Grainger Engineering Breakthroughs Initiative at Illinois and brings together junior faculty in bioengineering with the leaders and luminaries in the field. 08/14 First Few Grants Funded!! UM/FIU Collaborative Research Exchange Forum funds a collaborative effort with Dr. Bhansali (Chair, ECE) at FIU. We will be building a NEMS based Heart on a Chip for electrophysiological readouts! DJTMF BioNIUM funds a collaborative effort with Dr. Gomez and Dr. Jorda (Pathology Faculty members at the UM Miller School of Medicine). We will be building a model of Lung Cancer on a Chip with primary patient cells! PM Laboratory participated in NanoDays event organized by the Nanoscale Informal Science Education Network at the Patricia and Phillip Frost Museum of Science. NanoDays is a nationwide festival of educational programs about nanoscale science and engineering and its potential impact on the future and takes place at over 250 science museums, research centers, and universities across the country. Ashu presents the graduate seminar in the Department of Biochemistry and Molecular Biology at the University of Miami Miller School of Medicine.